Stipend payments for Journeyman, Postdoctoral Fellows (recent Ph.D.) and senior awards (e.g., faculty or sabbatical) are based upon the discipline and area of research. During the period of the fellowship, ORAU will provide group health insurance that includes medical, prescription drug, dental and vision coverage to eligible participants upon appointment in the program. There is no waiting period for coverage to begin. Postdoctoral Fellows and Senior Researchers are eligible for relocation expenses, according to established guidelines, and subject to Program Approval. This includes movement of household goods from your current address to the research site. 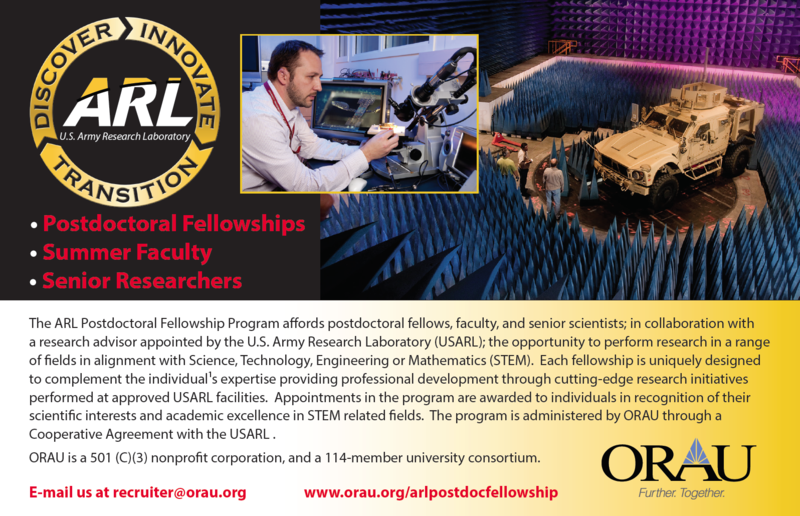 Fellows may be eligible for limited professional travel, provided such travel is recommended and approved by both ARL and ORAU.